There are a lot of ways to have fun as a family, and family bonding times is just a great experience overall. Every family has their own way of household time. Some families go out and have fun, and some families stay at home and have a blast. It doesn’t matter what the activity is, the time together is always cherished. Although if you are looking for thing to do for family game night, then you are in the right place. I happen to have a product that might be the perfect fit for your family when it comes to that time of night. It’s always great to have a variety of things to do, so adding this to your games is a must. So with that being said, check out the information on the product selection that I have for you below. 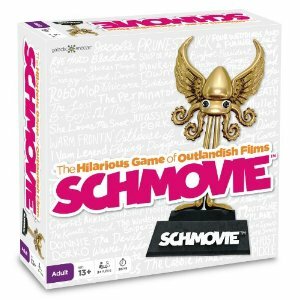 If your family is full of creative minds, then Schmovie: The Hilarious Game of Made-Up Movies is the game you need. In this game, everyone can win a trophy, and the only thing you have to do is come up with a goofy movie name. Schmovie is a product that’s all about creativity, imagination, and endless laughter. Some games have limits, but this is a game that has no boundaries at all and can get pretty insane. If you are looking to spice up any game night whether it’s for family or a group of friends, this is just the product you need. There is no other way to get this kind of excitement for so many people right? So check out the information on the product that I have for you above, turn any night into something incredibly fun and filled with some insane laughing moments. Previous Post: « To Keep or Not to Keep?